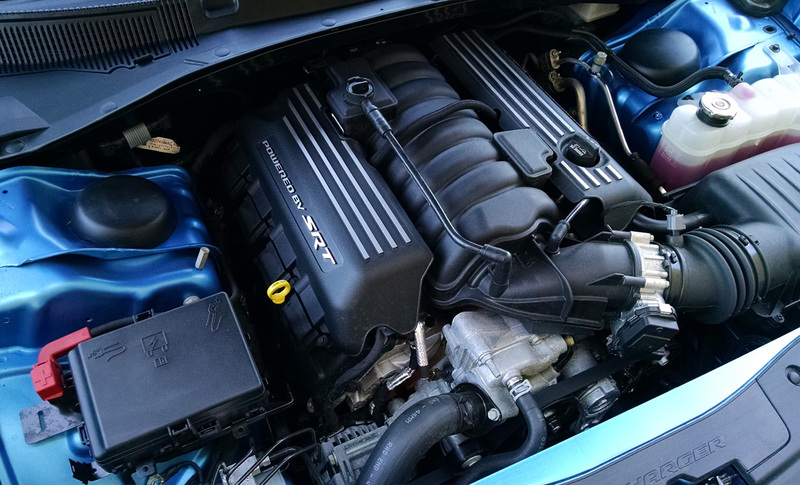 The SRT 392 HEMI or 6.4 liter V8, whichever you prefer has been offered in the Dodge Charger for some time. 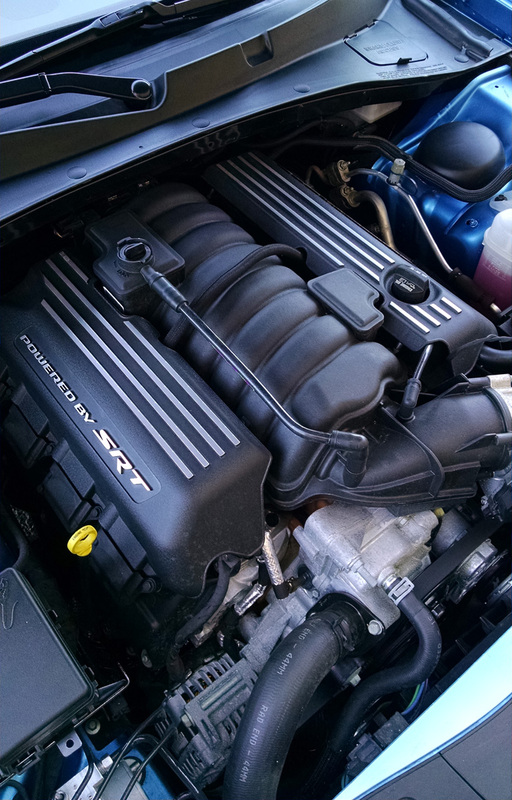 Before the 707 horsepower supercharged Hellcat V8 came along, it was to top of the ladder for performance in the Charger, now upper middle class. 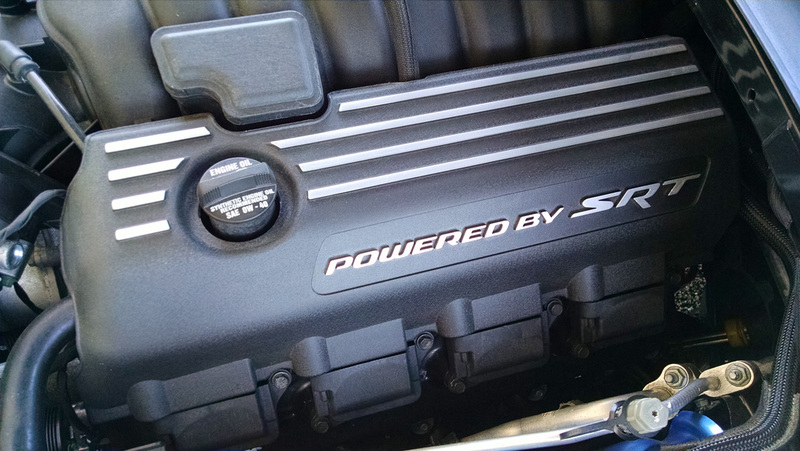 The iron block V8 produces a pretty robust 485 horsepower at 6,000 rpm, and 475 pound-feet of torque at 4,200 rpm. 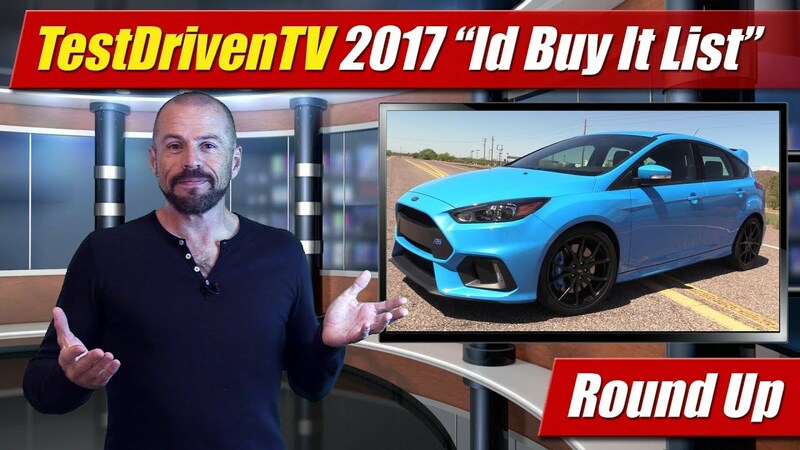 These are pretty stout numbers for a naturally aspirated engine, metrics that come by way of a moderate 10.9:1 compression ratio and recommended premium unleaded fuel. 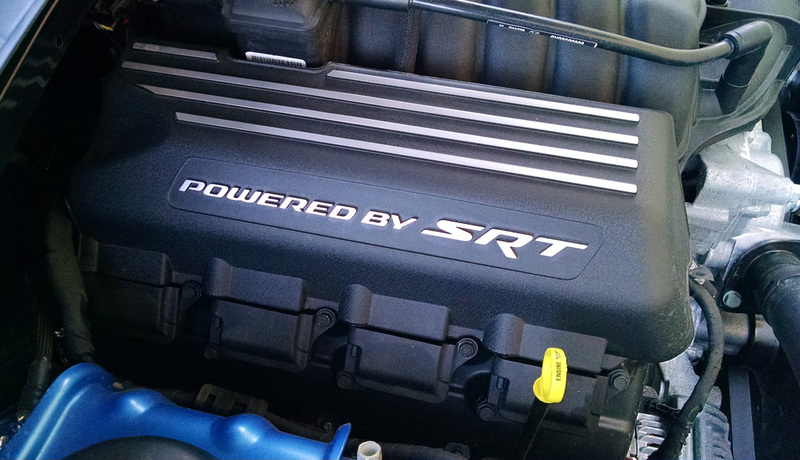 It’s a good looking engine too, so good in-fact it doesn’t have or need a full engine cover like most. Instead it has smaller wing covers that hide its fuel injection system, which is still a port injection arrangement with fuel rails atop the engine. Here they’ve used insulation covers to keep fuel temperatures down. 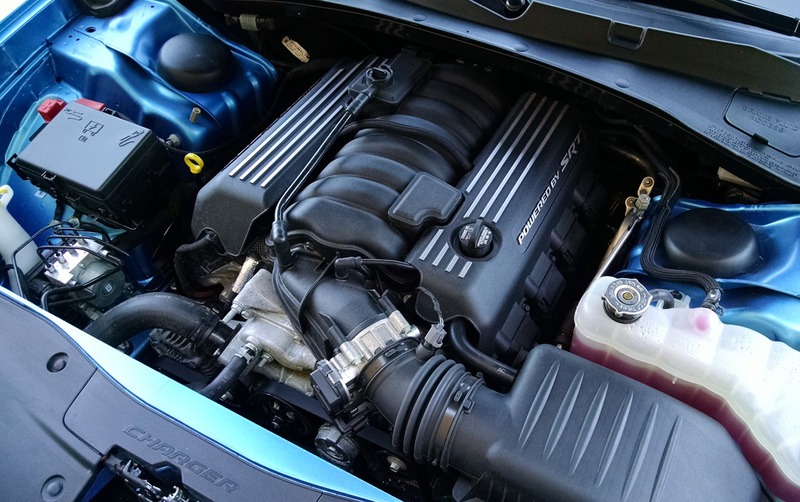 The aluminum “hemi” heads have the same two-spark plug design found on the smaller 5.7 liter V8, using individual coil packs for each cylinder. The block here is cast iron of course with its single cam and pushrods opening all sixteen of its valves. 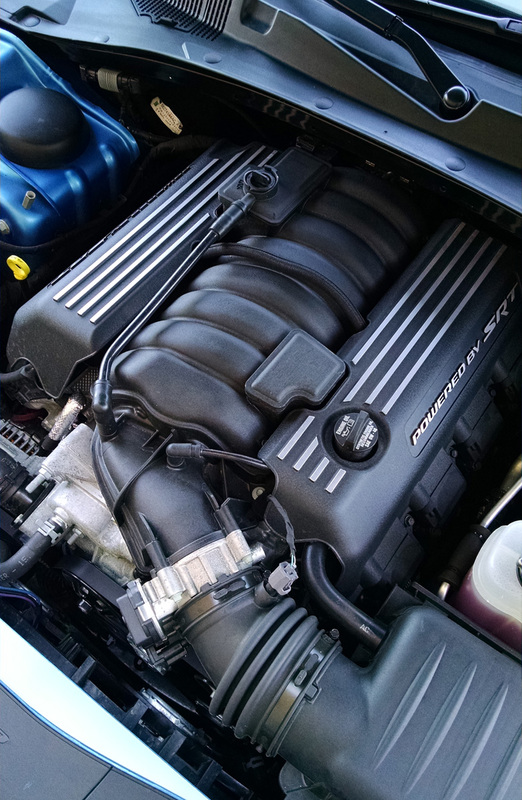 That might be mid-century technology still, but Chrysler has added a multiple displacement strategy, cutting of fuel to four of its cylinders to save fuel. This happens usually during coast or cruising at highway speed when additional power isn’t needed. 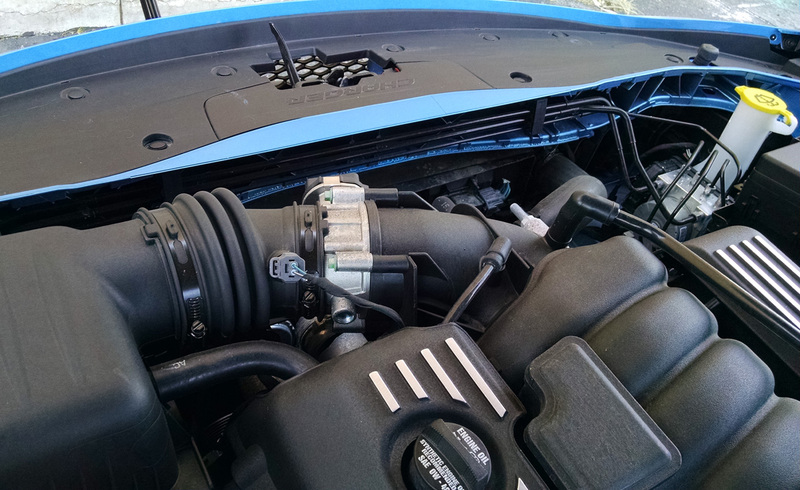 Following the airflow, breathing starts at the filter box up front behind the driver side headlight assembly. 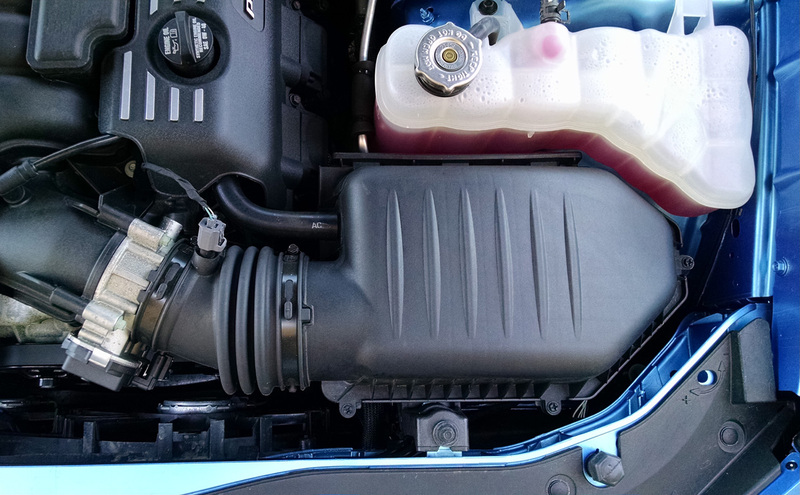 Air then leads to the engine through a large single throat throttle body, then up into its composite intake manifold. The design is similar to the last generation with it’s 8-pack abs look, but I miss the genuine aluminum casting it once was. After the combustion cycle, exhaust exits through tubular headers into the exhaust system which employs electronic flapper valves that open and close at different speeds to give you a nice growl when you want it, and no drone when you don’t. 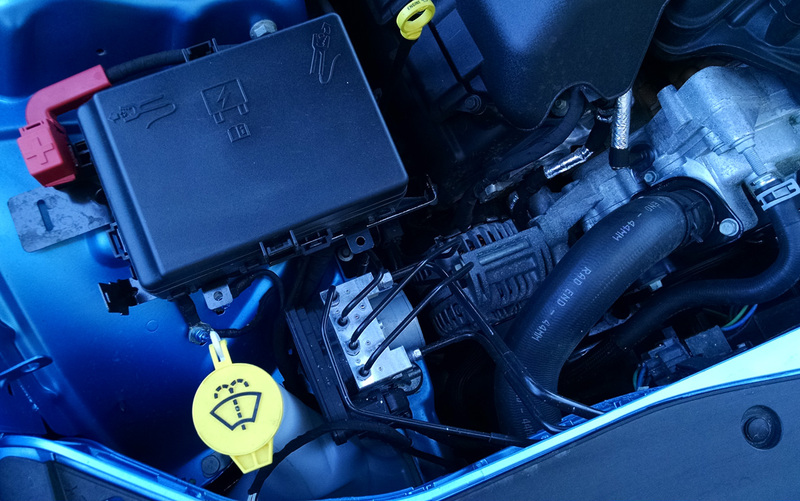 Service points for do-it-yourself maintenance are easily seen and reached. 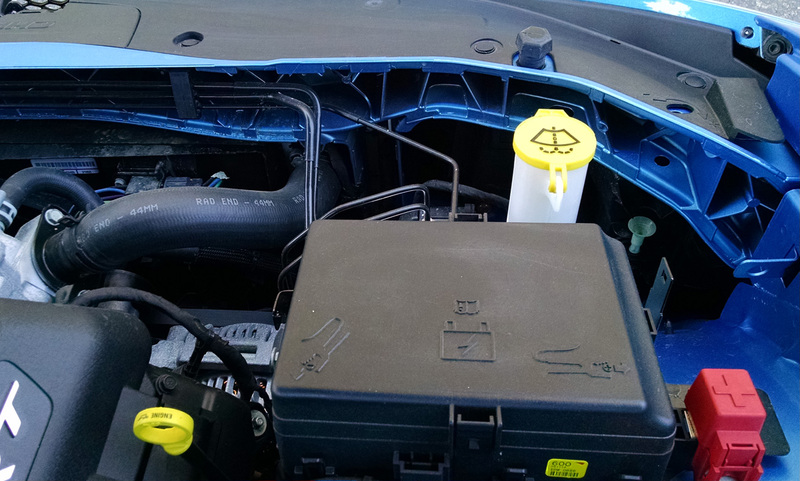 On the passenger side is the windshield washer fluid and the main fuse panel is located right behind it with jumper points. 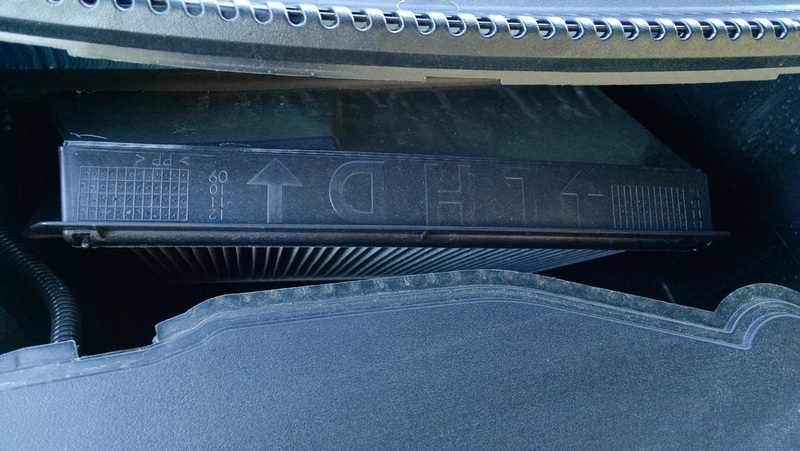 The battery itself is mounted in the trunk to save space and offer better weight balance. Up under a cowl access panel is the air filter for the interior HVAC system. Looking back up toward the front you can see the radiator support is made of molded plastic to save weight, and has all the brake lines routed along it, all terminating at the ABS control unit mounted behind the passenger side headlamp assembly. 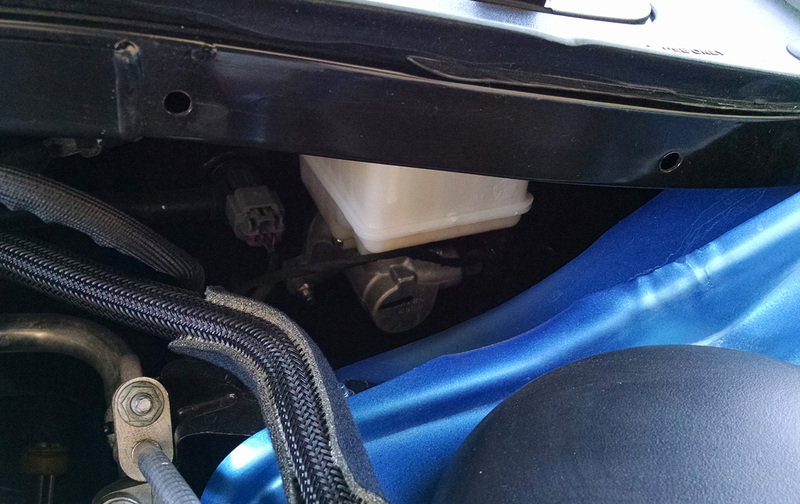 On the driver side is the air filter box which takes a little work to get open, then there’s the coolant reservoir in plain sight. 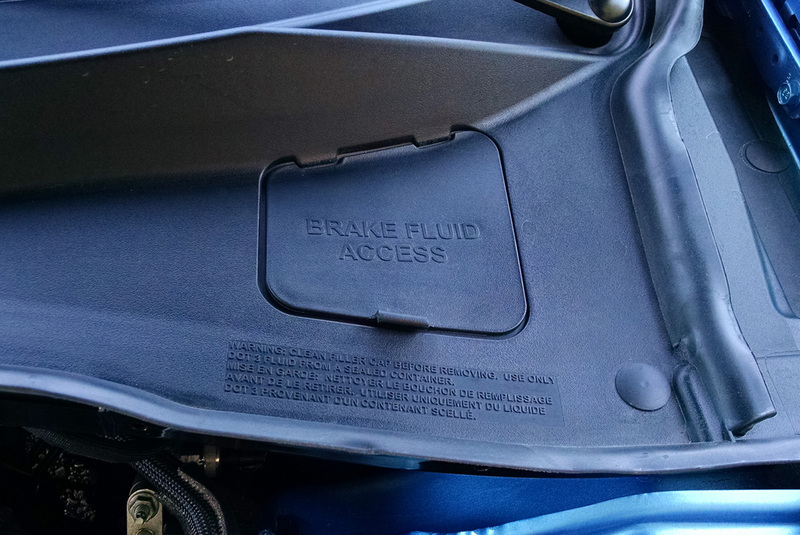 Checking and filling the brake fluid is at the back of the compartment under an access panel. 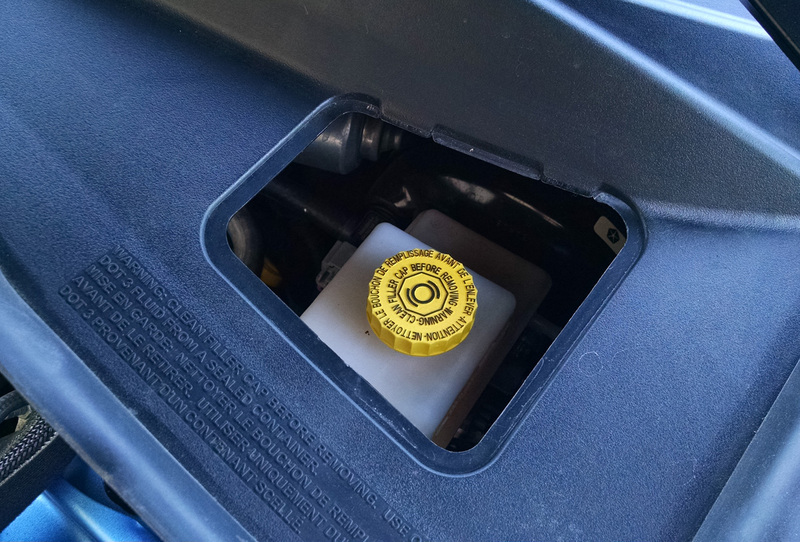 Once you find it, popping the cover and getting to it isn’t too hard. 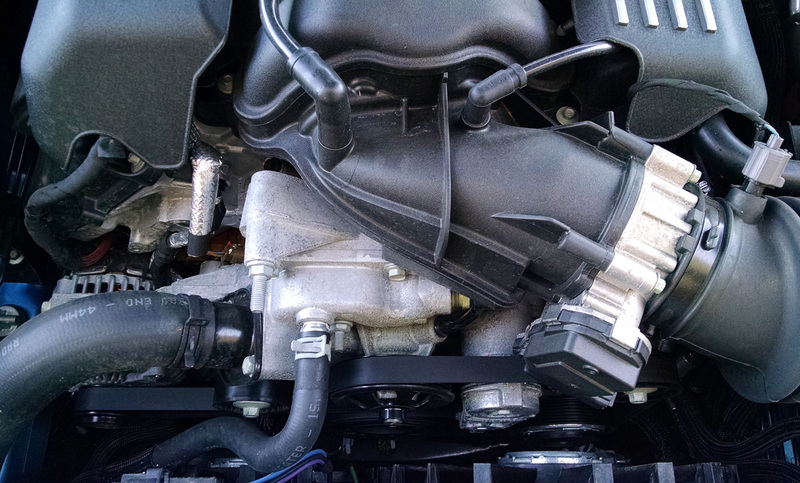 And lastly, oil fill and the dipstick are right on top, front and center – most easily seen with the engine cover panels reinstalled and back in place. 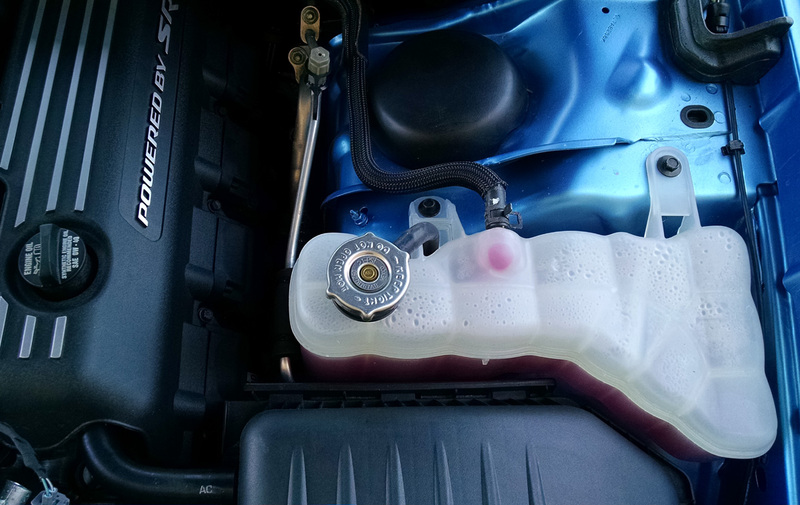 Standing back and looking around the engine compartment, you see it’s a pretty clean installation you can proudly pimp at a car show with the hood up. 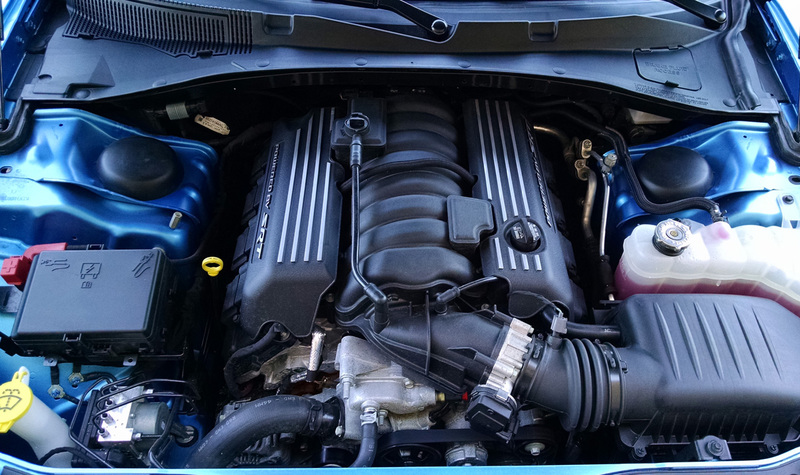 And the cool thing is that if you want to dress the Dodge Charger engine bay up and really make it sweet, there are lots of options in the aftermarket to do exactly that.